(Newser) – The promise of Lasik is it may offer an end to contacts and glasses; the reality is that it could lead to problems that may leave you longing for the old contacts and glasses. 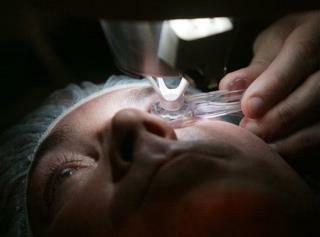 The New York Times reports on long-documented complications—including post-procedure complaints of double vision, painful dry eyes, seeing starbursts, and light sensitivity—from the popular laser eye surgery that first got the FDA's OK in the '90s, and how despite these issues, Lasik (aka laser-assisted in situ keratomileusis) continues to get ophthalmologists' enthusiastic seal of approval. A good number of doctors, in fact, say the 15-minute surgery is the safest medical procedure of any out there, and that complications that do arise often fade away after a few months. Plenty of people have been convinced: Some 700,000 pairs of eyes went under the light in 2017, per an ophthalmic market research firm. Perhaps this is nature's way of weeding out the vain and the lazy.